Sunshine and ocean views await you this summer in Cayman (Pictured above: Heritage House, Fischer’s Reef, Northern Lights, and Lone Palm). Get a spring on your summer vacation planning and book your dream beach house before it’s too late. We’ve rounded up a few of our favorites to help you find the perfect vacation home for your family. Rates as low as $1,695 per night. Savor the elevated Caribbean views from Our Cayman Cottage’s stunning pool and hot tub. 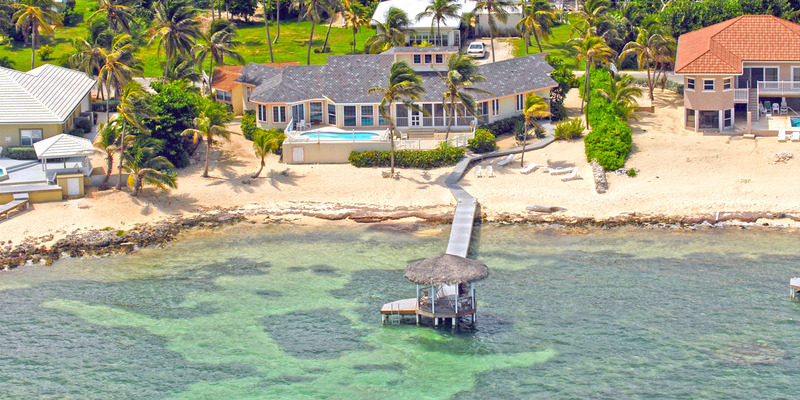 This family home sits in the secluded East End of Grand Cayman. Enjoy quiet days lounging in your own private pool and hot tub as you savor the scenic ocean views. This home offers great snorkeling nearby (you might come across a spotted eagle ray or two) and a sandy beach cove that gets raked every other day. Just don’t forget your pool shoes or fins for foot protection when in the water! With two tandem kayaks included, plus a retro-arcade and game room on the pool level, there’s something here for the whole family to enjoy. Rates as low as $1,150 per night. Plenty of room to bring the whole family down for an island vacation at Southern Ayr. If you’re looking to vacation with a squad of friends, or even another family, you’re going to need a villa with plenty of room. Southern Ayr is an ideal option with eight bedrooms spread across four floors and plenty of beach loungers so there’s no fighting over who gets to lounge under the sweet Cayman sun. The location is hard to beat too: 20 minutes from the airport, 25 minutes to Seven Mile Beach, and 20 minutes to Rum Point Beach. A small house staff comes included providing light meal prep and housekeeping during your stay. Rates as low as $950 per night. Escape away to this colorful villa for the perfect family vacation. This tropical paradise is a guest favorite among adults and kids alike. The kids will love the pool and sandy beach while the adults can sneak to the thatched cabana on the dock above the waves for some quality “me-time”. The dock is equipped with a ladder for gentle water entry into the Caribbean Sea. The snorkeling right off the dock is spectacular and will keep you entertained for hours. Far Tortuga is conveniently 5-minutes away from a small grocery store and only 10 minutes from Rum Point Beach. Rates as low as $710 per night. Heritage House is a great family home with a pool in front and a sandy beach out back. If you’re looking for a large beach to call your very own, then look no further! Heritage House is a great home for small families. 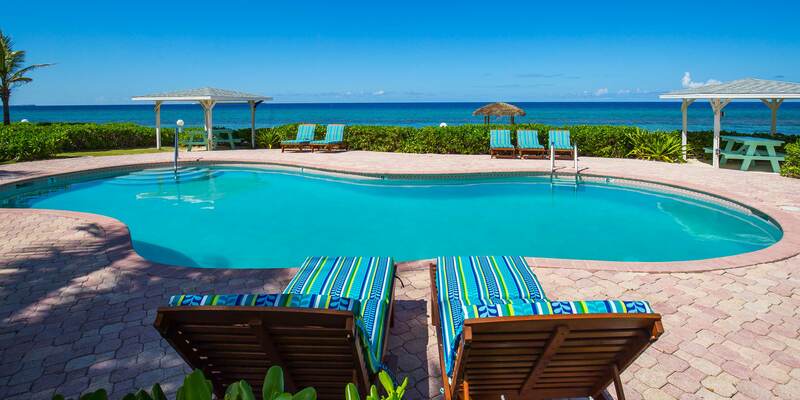 You get a beautiful soft beach and your own pool in the stunning Rum Point neighborhood. 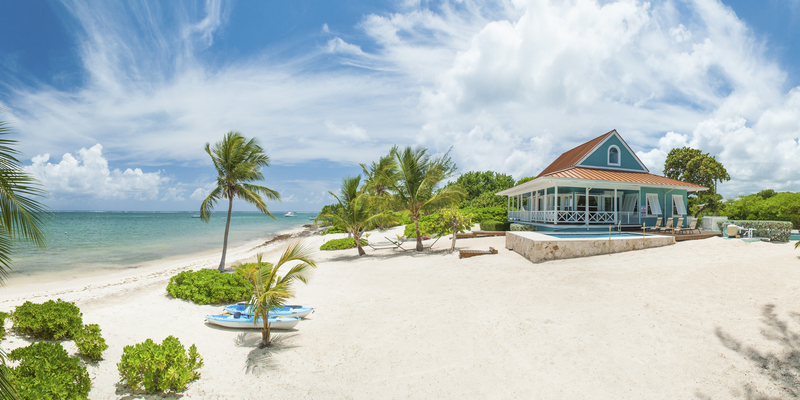 Walk down to The Rum Point Club for an afternoon of beach fun, watersports, and a quick bite to eat. The oceanfront porch has a family dining table for unforgettable dinners with a view. Rates as low as $800 per night. Sneak away to this hidden adventure retreat in Cayman Kai. This secret hideaway is superb for the active adventure-seeking family. 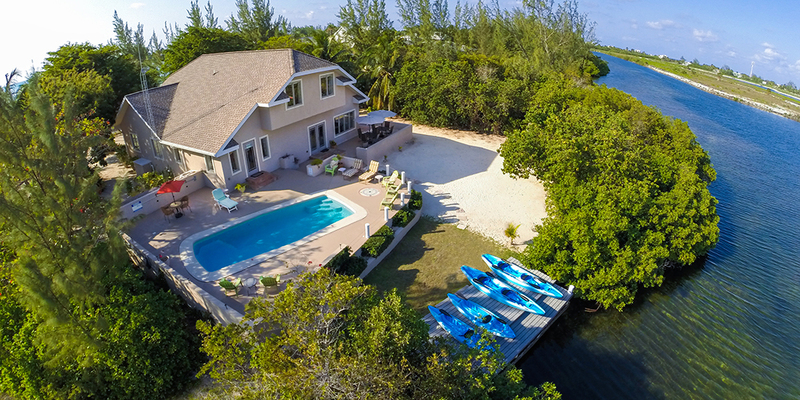 With 6 kayaks and 10 bikes, you’ll never run out of fun exploring Cayman Kai! Take the kayaks across the street to the public launch and explore Bio Bay at night. Watch the water glow as you paddle around one of the few bioluminescent bays in the world! With the villa’s private dock, thrill-seekers can rent jet skis and keep them moored behind the villa during their stay. After an entire day of fun under the sun, mount your bikes and cruise on down to The Kaibo for barefoot beach BBQ every Tuesday night. The Kaibo also has a casual restaurant with a full take-out menu featuring burgers and sandwiches, salads, entrees, and a kid’s menu. Rates as low as $2,400 per night. Enjoy a luxurious stay at Fischer’s Reef. This stunning home features eight bedrooms with plenty of gathering spaces, both inside and out, on a sandy stretch of beach in Rum Point. With two separate wings, Fischer’s Reef is the perfect fit for two families wanting to vacation together. Many of our guests end up loving Fischer’s Reef so much that they come back year after year. The stunning interiors rival the outdoor living areas making this beach house feel like a mini-resort. Escape the crowds for a relaxing stay at Northern Lights. Staying at Northern Lights No. 5 is like staying at your own private resort. This residential community of 9 two-story townhomes has only a few units participating in a rental program. That means fewer tourists crowding the pool deck and more room for you and your family to spread out. Located in the East End, Northern Lights features a shared oceanfront pool and thatched cabana pier with a ladder for gentle water entry. Rates as low as $550 per night. Venture to the East End for a slice of paradise at Lone Palm. With forty 5-star reviews, it’s easy to see why families love staying at Lone Palm. With gorgeous interiors, an oceanfront porch, private pool, and spectacular beach with great snorkeling, Lone Palm has it all. Located within walking distance to Ocean Frontiers, one of the best dive centers on Cayman, families can take SCUBA lessons before venturing out into open waters for their first dive together. A handful of restaurants are also within walking distance while a grocery store and two resorts are only a short drive away. Don’t delay! Our homes fill up quickly. Secure your spot on the beach and book your island oasis today! Need help with your vacation planning? Give us a call toll-free at 866-358-8455. Our villa team is on standby to match you with the vacation villa of your dreams.